These kid-friendly smoothies with vegetables are perfect for snack time. 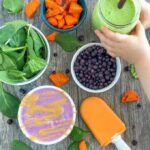 Packed with carrots, spinach or cauliflower, both kids and adults will love these simple, healthy smoothies or popsicles. Combine all ingredients in a high powered blender until well mixed. Serve in a glass, freeze into popsicle molds or pour into a bowl and top with peanut butter and granola. My kids usually split these. You can drink half and freeze extras in a mason jar, ice cube trays or popsicles. Feel free to experiment with swapping plain yogurt + sweetener of your choice, half plain/half flavored yogurt or adding extra mix-ins like more veggies, nut butter, hemp or chia seeds, etc.